Rituals of the Fellowship of the Sacred Grove are generally written to be celebrated by some combination of seven officers: a Priestess, a Priest, a Bard, and four Quarters. The Bard in Sacred Grove ritual has the role of a master of ceremonies, beginning and ending the ritual, announcing transitions, and responding to interruptions, disruptions and mishaps. The Priestess and Priest are the primary celebrants of the ritual. The Priestess invokes the Lord, and the Priest invokes the Lady. The Priest and Priestess lead the spiritual and magical dimensions of the ritual, while the Bard takes care of the external requirements. 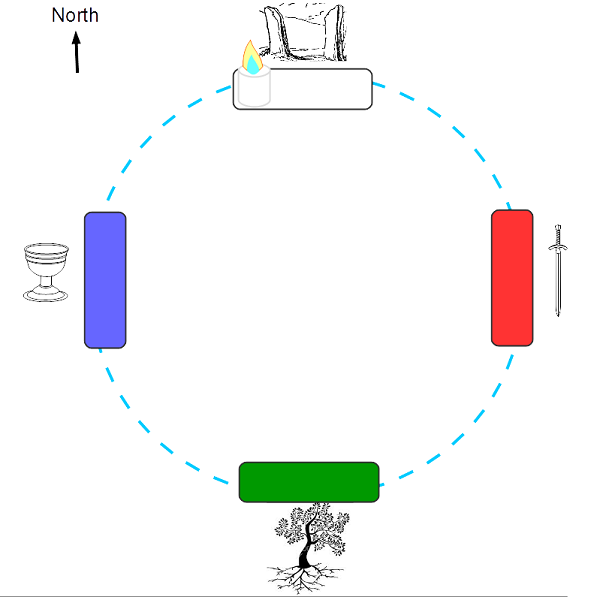 The Quarters — East, West, South, and North — act as secondary celebrants of the ritual. They derive their titles from the roles that they perform in the initial claimings and invocations, but they can take many additional duties depending on the particular ritual. Because the Bard and the Quarters perform major duties in the ritual, the roles of the Priest and Priestess, while central, are not unduly large. Alternatively, in a ritual of four or five officers, the roles of Priest and Priestess are eliminated altogether, and their duties are spread among the Quarters. If the participants gather outside of the ritual space, only the four Quarters enter and take their places. Otherwise, all enter together and take their places in the Circle. The Grove candle stands unlit on the North altar. The Warning and the Challenge are used in high ritual to prepare the participants for the ritual both psychologically and magically. Characteristically, the Warning is proclaimed by the Bard before participants enter the circle, while the Challenge administered to each participant as she enters the circle. Most of the participants will be challenged and admitted to the circle by the Priest and Priestess. If the ritual is very large, the Quarters and other officers may simultaneously challenge and admit participants at a second, third or even fourth gate. In high ritual, the Priest and Priestess themselves are normally the first to receive the Challenge, which is administered to them by the quarters. Then the Quarters leave the circle to re-enter through the Challenge procedure. In low ritual, the Challenge may be administered around the circle, each challenging the next. There is no single version of Warning or Challenge, they are crafted to harmonize with the particular purpose, intention, and tone of whatever ritual is taking place. One example of the Warning is given; the Bhakti-Wiccan circle includes Challenges with detailed instructions. Other examples are available. We gather tonight to open the veil between the worlds, to seek the Lord and Lady, and to experience the Mystery of Their Love. Hear this warning. This is not safe. To be touched by the Lord and Lady is to be changed. If you open yourself to that touch, you put at risk your comfortable view of the world. You risk experiencing a sense of awe to which worship is the natural response. You risk discovering Deity as your Lover and your Beloved. The Bard lights Grove candle. Let none enter (remain) who is unwilling to be changed by Their touch. If the Circle is cast with all participants present, replace the words Let all who enter with Let all within. Claiming the Space consists of four balanced spells to prepare the ritual area for magical work. The four Claimings are normally performed immediately after the Circle is cast, before any invocations or welcomings. Each of the four Claimings is performed by a person standing at the appropriate quarter and facing inward (not outward as in quarter calling). The normal sequence is East, West, South, North, to emphasize the polarities and balance of the working. The Claimings are spells and should be spoken with conviction and intent. The Bard and remaining Quarters respond So mote it be! to each Claiming. In the name of the Lady of Light, and in my own name, I claim this circle as a place of Men. Let all who enter be bound to speak and hear the Truth. In the name of the Sacred King, and in my own name, I claim this circle as a place of Women. Let all who enter be bound to Perfect Love and Trust. In the name of the Lord of the Greenwood, and in my own name, I claim this circle as a place of Nature. Let all who enter be bound to the Sacred Web of Life. In the name of the Queen of Heaven, and in my own name, I claim this circle as Sacred Space. Let all who enter be opened to the presence of God and Goddess. We have stepped beyond time, to a place not of Earth. In the presence of the Lord and Lady, we join together and are one. Beginning with the Bard, each person takes the hand of the person to the left, repeating We are one. When the Circle has been joined all around, all repeat together We are one. An optional segment of the ritual is inviting the Unseen to join us as Guardians in each of the Quarters. The Bhakti-Wiccan Circle provides an example tailored to the focus and intent of that ritual. Priest and Priestess lead participants in settling into a relaxed state, grounded and centered, then present to the Circle in readiness. The Charge of God and Goddess may be included in the Working. Magical workings, if planned, precede the Journey to the Grove. In the Sacred Grove, there is no scripted liturgy. Priest and Priestess lead participants in returning to full awareness, awake and alert, once more grounded and centered. The rite is ended, the circle is open. May the blessing of the Lord and Lady be with us all.